My main goal in teaching ESL to first graders is to make learning fun. I set the precedent for what language learning can be like for the rest of their educational career; I have the ability to shape the way these students see the English language. It’s not all drudgery and grammar and pronunciation… no, no, learning English is an exciting adventure! My class and I are making our way through the English alphabet. I intend on the students knowing all 26 letters and their simple sounds by the end of the year. I am not, however, going through the alphabet in the tradition A-Z fashion, but instead in an order that gives the most simple and most common letters and sounds first–thus paving the way for reading simple words early on. We are 15 letters in. I teach class on Tuesdays and Thursdays. I typically introduce a new letter on Tuesday and then we spend some time practicing the sounds, writing the letter out, doing flash cards and playing a few games to help with sound recognition and then on Thursday we work on the same letter using different methods of learning. For “E” they had to use their elbows to crack eggs. For “D” I brought donuts and plastic dinosaurs. The ‘dinosaurs’ had to try to make Ds out of the donuts. The most recent letter I taught was V.
What in the world can we do with V? As it is the holiday season and our home had recently hosted a Staff Christmas Party…one of Tracy’s party games came to mind. 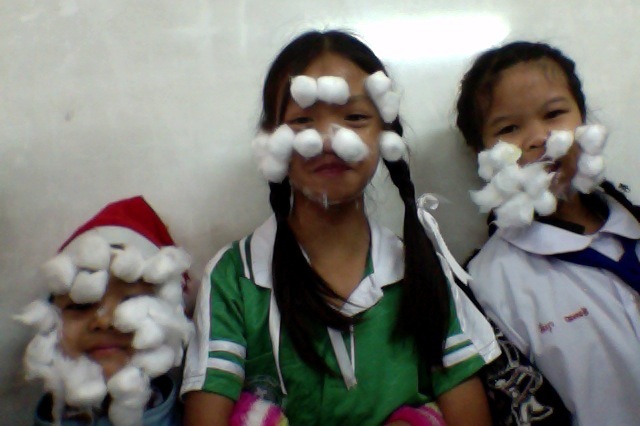 So on Thursday after a brief review of what the letter “V” says, I put the kids into teams of three, whipped out the cotton balls and vaseline…and the children got to work. The game was a hit. The laughter was uncontrollable. Unfortunately, there were some unforeseen hiccups with playing this game. Namely the task of de-vaseline-ing my students. Their hands and faces were covered with the sticky gel and the ice cold water was not doing the removing trick. The majority of my students ended up soaking wet in the 40 degree Thailand weather, and I had to help them take off their uniforms and lay them in the sun to dry–which, in turn, left me with a classroom of first graders shivering in their undershirts.